FSU Art Professor, Lilian Garcia-Roig, is currently featured in the June/July issue of New American Paintings. This issue’s juror is Emily Stamey, Curator of Exhibitions at the Weatherspoon Art Museum at the University of North Carolina, Greensboro. 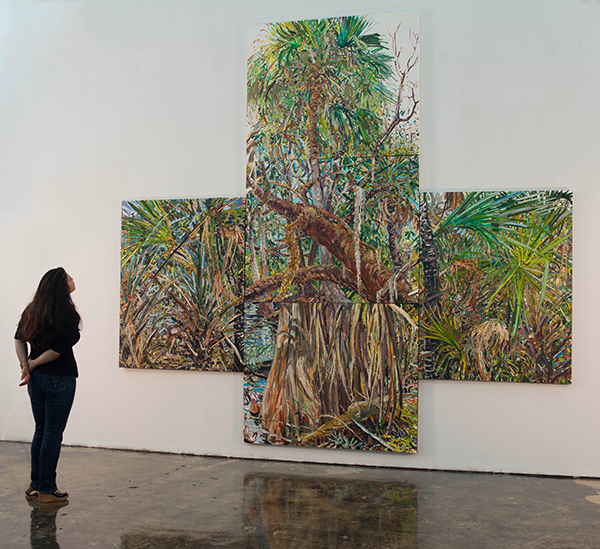 Garcia-Roig’s latest work features large-scale, multi-panel paintings, each created on site over the course of an entire day. The intense wet-on-wet cumulative process underscores the complexity of capturing firsthand the multidimensional and ever-changing experience she has at that specific location. Formally, the works are as much about the materiality of the paint and the physicality of the painting process as they are about reconciling the illusionist possibilities of painting with its true abstract nature. New American Paintings is a juried exhibition-in-print. Each museum-quality issue results from a highly selective juried competition and presents the work of forty painters. Thousands of artists enter our competitions every year, but only a limited number make it through the jurying process. We work closely with renowned curators in order to select those artists whose work deserves to be seen by a wider audience. Unlike other art publications, New American Paintings does not discriminate by style or yield to art-world trends.